The Sepsis Coordinator Network opens with support from founding sponsor Edwards Lifesciences. San Diego, Calif, May 22, 2018 – Sepsis Alliance, the nation’s leading sepsis patient advocacy non-profit organization, launched the Sepsis Coordinator Network today, a first of its kind online network that provides healthcare professionals with evidence-based best-practice resources and guidance to improve outcomes for patients with sepsis. In the United States, sepsis affects more than 1.7 million people and takes 270,000 lives each year. Sepsis is the body’s overwhelming response to infection, which can lead to tissue damage, organ failure, amputations, and death. 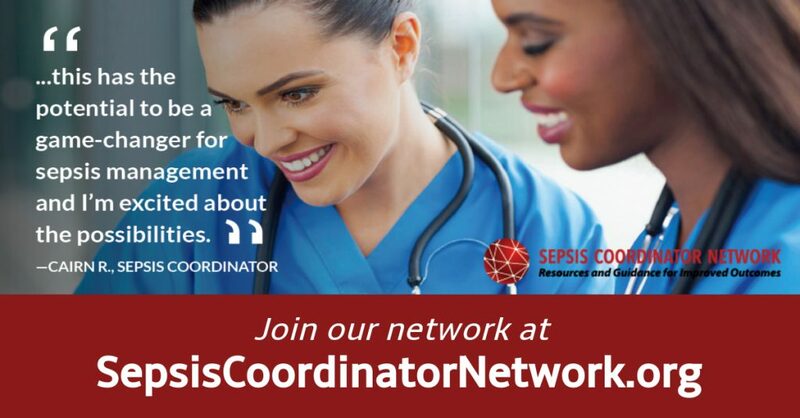 The Sepsis Coordinator Network was developed by an advisory committee of nursing leaders with critical experience developing and implementing lifesaving sepsis protocols and working with septic patients. A complementary team of healthcare professionals from across the continuum of care will serve as clinical advisors in specialized areas. They include physicians, pharmacists, and mental health specialists, among others. The network also provides professionals with peer-to-peer forums to ask questions and get support from sepsis experts when they face challenges in their daily practice. “The Sepsis Coordinator Network is bringing together evidence-based sepsis best-practices from healthcare professionals across the United States, in a way that has never been done before, and has the potential to change the way sepsis is treated at every hospital across the United States” said Angela Craig a member of the Sepsis Coordinator Network’s Advisory Board and a Clinical Nurse Specialist at the Cookeville Regional Medical Center, in Cookeville, TN, who has led multiple successful sepsis initiatives to improve patient outcomes. The Sepsis Coordinator Network is open to all healthcare professionals with an interest in improving sepsis care and there is no fee to become a member. Interested parties can register at www.SepsisCoordinatorNetwork.org. The Sepsis Coordinator Network was made possible with support from founding sponsor Edwards Lifesciences.